This article was last updated Jun 28, 2018, but some terms and conditions may have changed or are no longer available. For the most accurate and up to date information please consult the terms and conditions found on the issuer website. The Southwest Rapid Rewards® Premier Credit Card is certainly a card you should consider having in your wallet if you’re a regular Southwest Airlines flyer and belong to its Rapid Rewards® loyalty program. If you’re looking for airline perks like priority boarding or airport lounge access offered by other cards, you won’t find that with the Southwest Rapid Rewards® Premier Credit Card. And while there are other airline- and travel-branded credit cards that offer more points for spending on dining, groceries or gas, you do earn extra points for spending on Southwest-related travel and Rapid Rewards hotel and rental car partners. In the end, it comes down to whether the Southwest Rapid Rewards® Premier Credit Card’s ability to earn bonus points that help with elite status, extra points for your cardmember anniversary and a few more travel and purchase perks make the higher annual fee worth it to you. 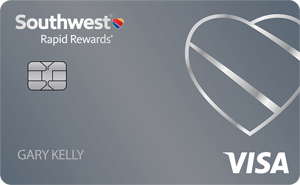 The biggest benefit of the Southwest Rapid Rewards® Premier Credit Card is the chance to earn 1,500 Tier Qualifying Points (TQPs) every time you spend $10,000, with a spending cap of $100,000 a year. These TQPs help you earn Rapid Rewards points that go toward earning A-List or A-List Preferred elite status on Southwest. Cardmembers also earn 6,000 bonus points on their anniversary and you can earn 10,000 bonus points for each friend who gets the card, up to 50,000 a year. A-List status gives you priority check-in and dedicated security lanes (where available), along with priority boarding, a 25% points bonus on tickets booked, a dedicated customer service line and free same-day standby on flights. A-List Preferred members get all of the above, plus a 100% points bonus and free in-flight Wi-Fi. You also have the ability to earn Southwest’s popular Companion Pass. To get one, you either have to fly 100 qualifying one-way flights or earn 110,000 qualifying points in a calendar year. Once you have it, you can bring a companion along for free on every flight you buy or redeem with Rapid Rewards during a calendar year. There are no blackout dates or seat restrictions, you earn unlimited points that don’t expire as long as your card account is open and there are no limits on how many points you can earn. You can use your points to travel to 100 destinations in the U.S., Mexico, Central America, and the Caribbean. Southwest offers two free checked bags for all travelers. 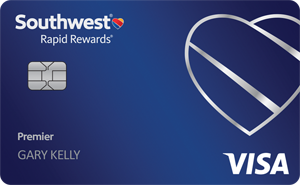 And the card comes with a few more travel and purchase perks than the Southwest Rapid Rewards® Plus Credit Card. The points per $1 spent you earn on the Southwest Rapid Rewards® Premier Credit Card are not as good as other travel-branded credit cards, especially in the dining, grocery and gas categories. You earn 2 points per $1 spent on Southwest® purchases and Rapid Rewards® Hotel and Car Rental Partner purchases. 1 point per $1 spent on all other purchases. Don’t get this card if you want to use your points on flights outside of the United States because the number of places you can go are very limited. You can fly Southwest Airlines to the Caribbean, Mexico, Belize and Costa Rica — and the airline recently announced plans for Hawaii flights — but you’re out of luck if you want to go to other international destinations, since the airline doesn’t have partnerships with any global carriers. If you want to go for the airline’s Companion Pass, you’ll have to either earn 110,000 Rapid Rewards qualifying points in a calendar year or fly 100 qualifying one-way flights. You’re responsible for paying any taxes and fees on the companion fare. Domestically, that includes the Sept. 11 security fee. If you’re traveling outside the country, you’ll also have to pay a U.S. Customs User Fee, a U.S. APHIS User Fee and a U.S. Immigration User Fee, along with U.S. or international government-imposed taxes and fees, depending on your itinerary. Unless you travel pretty regularly, it may be difficult to fly enough to reach the Companion Pass’ qualifications. In addition, cardmembers with A-List or A-List Preferred status flying with family members or travel companions cannot share their early boarding benefits. Purchase protection that covers new purchases for 120 days against damage or theft up to $500 per claim and $50,000 per account. Travel Accident Insurance — You are eligible to receive coverage for accidental death or dismemberment (up to $500,000) when you use your card to pay for air, bus, train, or cruise transportation. Travel and Emergency Assistance Services — Call the Benefit Administrator for legal and medical referrals or other travel and emergency assistance if you run into a problem away from home; however, you will be responsible for the cost of any goods or services obtained. Lost luggage reimbursement — You and your immediate family members are covered for checked or carry-on bags if they’re damaged or lost by the carrier for up to $3,000 per passenger. Baggage delay insurance — You can get reimbursed for essential purchases like toiletries and clothing for baggage delays more than six hours by passenger carrier up to $100 a day for three days. Auto Rental Collision Damage Waiver — You can decline the rental company’s collision insurance and charge the entire rental cost to your card. The coverage is provided for theft and collision damage for most rental cars in the U.S. and abroad (in the U.S., coverage is secondary to your personal insurance). Roadside Dispatch–For assistance with a roadside emergency, call 1-800-847-2869 anytime to dispatch help: anything from a tow or jumpstart to a tire change, lockout service, winching or gas delivery. Roadside service fees will be provided when you call and will be billed to your card. An extension on a U.S. manufacturer’s warranty by a year on eligible warranties of three years or less. If you’re trying to decide between the Southwest Rapid Rewards® Premier Credit Card and the Southwest Rapid Rewards® Plus Credit Card, it could be tough — they both have the same sign-up bonus and points per $1 spent. They also both have the ability to earn the popular Companion Pass and many of the same travel and purchase perks. The Southwest Rapid Rewards® Plus Credit Card offers two ways to earn extra bonus points: one, you earn 3,000 bonus points every account anniversary year; and two, you can earn 10,000 bonus points for each friend who is approved for the Southwest Rapid Rewards® Plus Credit Card, up to 50,000 a year. Like the Southwest Rapid Rewards® Premier Credit Card, your points help you earn A-List and A-List Preferred elite status, and the benefits that come with each, on Southwest Airlines. And you can earn the Companion Pass if you fly 100 qualifying one-way flights or earn 110,000 qualifying points in a calendar year. This card also doesn’t have blackout dates or seat restrictions; you earn unlimited points that don’t expire as long as your card account is open, and there are no limits on how many points you can earn. But the points earned on both cards can only be used on the routes flown by Southwest Airlines, which has a very limited number of international destinations. And you only get lost luggage reimbursement, baggage delay insurance, extended U.S. manufacturer’s warranty and purchase protection with this card. How do you choose? We show you the numbers, below. Rewards 2 points per $1 spent on Southwest® purchases and Rapid Rewards® Hotel and Car Rental Partner purchases. 1 point per $1 spent on all other purchases. 2 points per $1 spent on Southwest® purchases and Rapid Rewards® Hotel and Car Rental Partner purchases. 1 point per $1 spent on all other purchases. Sign Up Bonus Earn 40,000 points after you spend $1,000 on purchases in the first 3 months. Earn 40,000 points after you spend $1,000 on purchases in the first 3 months.